If cholesterol has been a problem for you, your doctor may have told you about Zetia (ezetimibe) or Vytorin (ezetimibe plus simvastatin). Vytorin was developed as a combination of Zetia and Zocor (simvastatin), which was intended to enhance Zocor's cholesterol-fighting properties. Confusing? Just remember that Zocor is a simple statin -- a kind of drug that works in the liver to prevent cholesterol from forming. Zetia is a newer drug, developed to inhibit the absorption of cholesterol from food in the intestines. 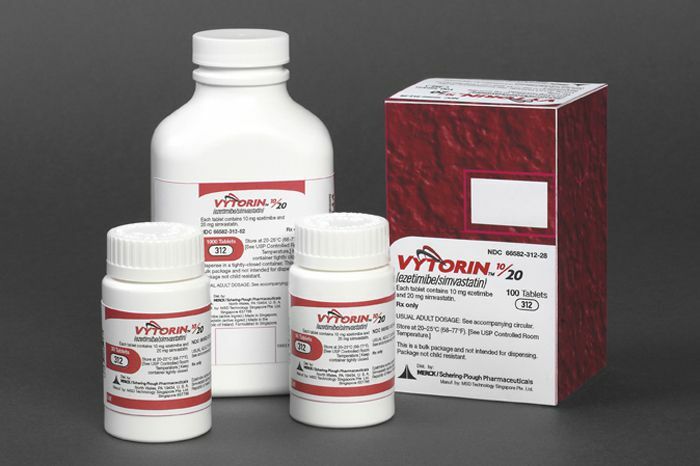 Vytorin is a combination of both Zocor and Zetia. Vytorin was introduced to the public in 2004 through TV ads that claimed Vytorin could fight the two sources of cholesterol: food and genes. Vytorin joined an array of cholesterol drugs that were already available on the market, but for a considerably lower price. However, heavy marketing of Zetia, and then later Vytorin, quickly catapulted U.S. cholesterol prescriptions of these drugs. Zetia and Vytorin were initially approved by the FDA in 2002 and 2004, respectively, for their ability to lower the "bad cholesterol" (LDL). The "bad cholesterol" is believed to be responsible for the buildup of plaque on arterial walls that can lead to a stroke or heart attack. In January 2008, Merck/Schering Plough Pharmaceuticals -- the maker of both Zetia and Vytorin -- released the results of a study on the effects of the combination of ezetimibe and high-dose simvastatin versus simvastatin alone on the atherosclerotic process in patients with heterozygous familial hypercholesterolemia, called the ENHANCE study. This study compared 720 patients taking either Vytorin or only Zocor. By using ultrasounds to examine the neck arteries of these patients from both groups, researchers hoped to determine if the combination drug, Vytorin, had lowered the incidence of plaque buildup in their arteries. The expectation was that those taking Vytorin would be shown to have less plaque on their arterial walls than those who took Zocor alone. Instead, the conclusions of the study indicated that Vytorin patients had no less plaque in their arteries than those taking only Zocor. In fact, those taking Vytorin actually had slightly more plaque. A second study, called the Improved Reduction of Outcomes: Vytorin Efficacy International Trial (IMPROVE-IT), measured outcomes in over 18,000 patients who had previously had a heart attack. The results of this study, reported in 2014, found significantly more patients on the Vytorin ezetimibe/simvastatin regimen met their targets for both LDL-C and hs-CRP than those on simvastatin alone. They had better health outcomes if they met both targets, as measured by cardiovascular death, major coronary event, or stroke. Their risk of a repeat heart attack or stroke was reduced by 6%. The combined therapy showed no significant adverse effects, especially for risk of cancer. This continued the controversy - is it worthwhile to take a drug that makes your labs look better, but has minimal improvement of your health outcomes, if any? Vytorin had warnings and precautions added in 2010 and updated regularly that warn of increased risk of myopathy/rhabdomyolysis. These include warnings of this in interactions with niacin and fibrates. Should I Stop Taking Zetia or Vytorin? Not so fast. Arterial plaque aside, the Vytorin patients did do quite well in another measurement, that is, reduced levels of the "bad cholesterol," which is the same result that won FDA approval in the first place. Compared with the Zocor patients, the Vytorin patients experienced a significant drop in "bad cholesterol" levels. As to why the Vytorin patients in the study had lower "bad cholesterol" levels with no improvement in arterial plaque is not yet understood. The FDA is continuing to investigate this evidence. As for Zetia, previous studies have shown that this drug also affects lower "bad cholesterol" levels. Even when not combined with Zocor, those patients taking Zetia seemed to have results that inhibited the absorption of cholesterol from the foods passing through the intestines. Even with disappointing results in the first study, Vytorin was not shown to be unsafe. The statin contained in Vytorin has long-proven benefits for fighting cholesterol. Vytorin or Zetia may have been prescribed for some patients because Zocor or another statin alone was not effective in lowering their "bad cholesterol." Alternative medications may not have been advisable for some patients, because of unrelated medical conditions. As always, you should check with your doctor. Ask whether there are circumstances that should keep you on the current course of treatment or if you should begin to explore some alternatives. Continue following the recommended lifestyle changes of diet, exercise and smoking avoidance to keep your cholesterol in check. Keep your appointments and note any changes in your lipid panel to determine whether your drug therapy is working as expected. Monitor your day-to-day symptoms and report any side effects you may be experiencing to your doctor. The FDA is continuing to evaluate the findings of studies to determine whether any action is warranted. If you believe that you have suffered from side effects, or if you have experienced an adverse event such as a heart attack or stroke, while taking Vytorin or Zetia, you are asked to report it to the FDA's MedWatch Adverse Event Reporting program online. American Heart Association Staff. "Drug Therapy for Cholesterol." AmericanHeart.org. 4/21/2014. American Heart Association. February 11, 2016. Jackevicius, Cynthia. "Use of Ezetimibe in the United States and Canada." New England Journal of Medicine. 28 Mar. 2008. New England Journal of Medicine. 3 Apr. 2008. US Food and Drug Administration Staff, "Early Communication about an Ongoing Data Review for Ezetimibe/Simvastatin (marketed as Vytorin), Ezetimibe (marketed as Zetia), and Simvastatin (marketed as Zocor)." FDA.gov. 25 Jan. 2008. US Food and Drug Administration. 29 Mar. 2008. US Food and Drug Administration Staff, "Vytorin (ezetimibe/simvastatin) tablet." FDA.gov. February 2014. US Food and Drug Administration. February 11, 2016. Lancellotti P, Pierard LA, Scheen AJ. [ACUTE CORONARY SYNDROME AND LIPID-LOWERING THERAPY. DOES THE IMPROVE-IT STUDY MAKE ANY DIFFERENCE?]. [Article in French]Rev Med Liege. 2015 Sep;70(9):450-5.